Dr. Robert Sanner and Erika Aparakakankanange will now be serving the undergraduate students of the Aerospace Department as the new director and assistant director, respectively. Dr. Sanner received his BS, MS and Ph.D. from the Massachusetts Institute of Technology and joined the aerospace faculty in 1993. Dr. Sanner teaches ENAE 202, Aerospace Computing and ENAE 641, Linear System Dynamics. His past service to the department includes membership on the undergraduate committee as well as the chair of the Dynamics and Control Curriculum Committee. When asked about his appointment to the directorship, Dr. Sanner said, "I am excited to work with Erika, the students, and faculty in strengthening our already formidable undergraduate program. We will work hard to maintain the standard of excellence set by Drs. Roop, Flatau, and Lewis before us in this important function." Erika was previously known to students, faculty and staff as the department?s program management specialist. She will be replacing Dr. Nicole Roop, who served as the department?s assistant director of undergraduate studies and who is now the Undergraduate Academic Policy Administration Specialist at the University of Maryland, Baltimore County. ?While I do have some big shoes to fill, I?m motivated to be here for the students,? Erika states, ?and my vision is that Dr. Sanner and I will foster an environment that perpetuates the successful atmosphere that has characterized the aero department.? Erika is also a Ph.D. student in the school of education?s department of Education Policy Studies. 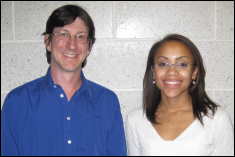 Dr. Sanner and Erika are available to answer questions that prospective and current students may have about the undergraduate program, department requirements, and UMCP resources.